It was Sunday lunch – but not as you would know it. 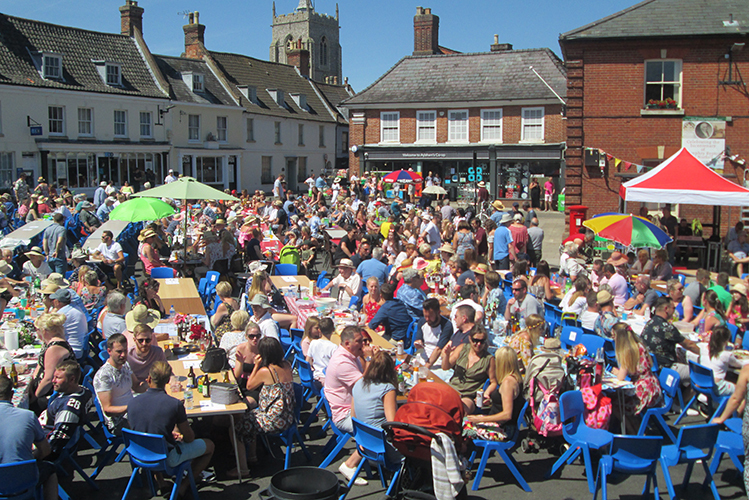 And the only roast was in Aylsham Market Square which baked in temperatures around 25°C. 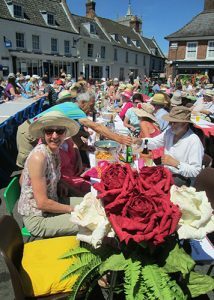 But Slow Food members turned out in their straw hats and picnic hampers (left) to join nearly 900 others for the annual street party in the Market Square to enjoy lunch, meet friends, listen and dance to the music of local band Night Train. The theme for this year’s party was hares and roses celebrating Humphry Hare, part of this year’s GoGo Hares Norfolk Trail. It was also one of the final events commemorating the 200th anniversary of the death of the renowned landscape gardener Humphry Repton who is buried in Aylsham Parish Church. 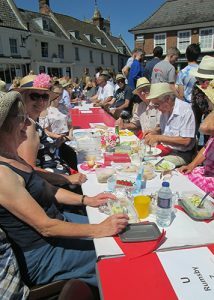 About 15 per cent of the townsfolk turned out for what was the third year Aylsham has held a lunch in the Market Place starting in 2016 in celebration of the Queen’s 90th birthday.